Treating type 1 diabetes is not to cure you of the condition. Currently, there is no cure. Treatment of type 1 consists of an ongoing process of managing your condition. Most professionals working with diabetes opt for the term “management” over “treatment” because the word management implies an active involvement in your daily self-care. Treatment of type 1, in contrast, is often interpreted as passive and doing only what is necessary. Though the terms can be used interchangeably, we will use management here because we want to encourage you to take a proactive approach to your diabetes. The short term goal immediately following diagnosis is to bring high blood glucose levels into an acceptable range. Because the onset of symptoms is often sudden and severe, some people may require hospitalization to stabilize blood glucose levels. Once glucose levels have stabilized, the long-term goal is to manage glucose levels on a daily basis to reduce the risk of diabetes-related complications that can affect your vision, nerves, heart and blood vessels and kidneys. Insulin lowers the level of glucose in the blood by allowing it to enter your cells to be used for energy. 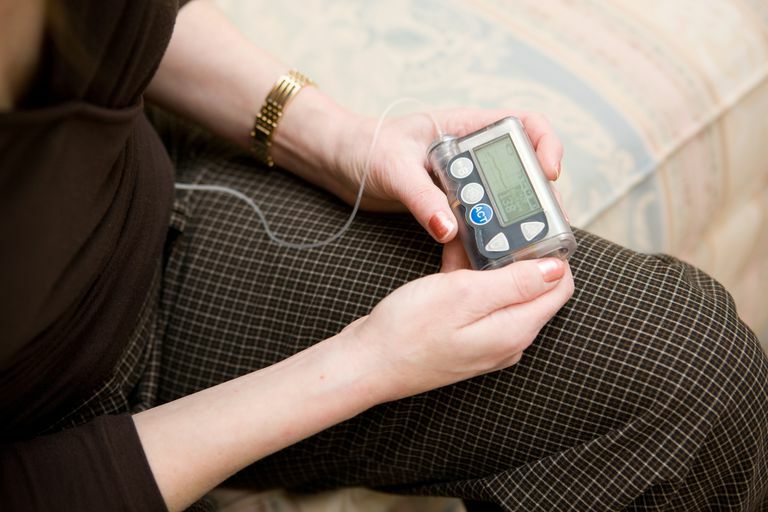 Since people with type 1 can no longer depend upon their pancreas to produce insulin, it must be obtained from injections or an insulin pump every day. There are a number of insulin preparations available these days. They range from short-acting to long-acting and can be mixed together if your doctor believes this will enable you to achieve better control of your blood glucose. Your doctor will prescribe the type(s) best suited for your situation. Though researchers are searching for additional ways to administer insulin without a needle, such as inhaling it or taking pills, injections are still the only way to get the necessary insulin that people with type 1 need to live. Meal planning is an important part of managing your type 1 diabetes. The reason you must follow a meal plan is that you have to balance the insulin you take and food you eat. Remember, food increases your glucose levels, insulin brings it down. You always have to consider one when taking the other. And don’t believe the old myth that says you can’t eat anything sweet or you must give up your favorite foods. The truth is, you can eat most anything you want as long as you factor it into your overall meal plan for any given day. Exercise works in a similar way that insulin does; it reduces the amount of glucose in your blood. It’s not a substitute for insulin but rather an additional healthy way to further lower your glucose. Another benefit of regular activity is that it helps you achieve your optimal weight. And the closer you are to your target weight, the better your body will use the daily insulin you take. But before starting an exercise routine, consult your doctor. Having type 1 diabetes requires that you give special attention to your blood glucose before your activity, during and after to help prevent a sudden drop in blood glucose levels. The only way you can confidently know what your blood glucose level is at any given time is to test it. Regular testing will help you identify high and low levels before serious problems could develop. When testing is performed on a regular basis, it helps you assess how well you are balancing your insulin therapy, meal planning and exercise to manage your diabetes. These test results will also provide valuable information for your doctor to help make adjustments to your overall care plan. Fortunately, there are many small, pocket-sized blood glucose monitoring devices that will check your glucose levels in seconds using only a small drop of blood. Many of these devices also allow you to download your results to your computer to make graphs and charts of your readings to help spot trends or trouble spots. What is an A1c Blood Test Kit and Why is it Important? You can purchase these blood glucose monitors at your local pharmacy. But your better option is to talk with your healthcare provider who may be able to get you one along with a small number of test strips for free. The companies that manufacture glucose monitors supply physicians and diabetes educators with monitors hoping they will pass them to their patients. Other options include asking your pharmacist about discounts or rebate coupons or call the manufacturer directly. But getting any monitor, find out whether your insurance will cover the meter and strips. Some insurance companies will only cover particular meters.